Okay, let's back this up just a bit. The Quarry District of Rocklin (we who have lived here a few years, okay, LOTS of years) call it "old Rocklin" because Taylor/Pacific road defined the original Rocklin area and filled in towards Highway 65 on Sunset Blvd from there into "new Rocklin". No, I'm not making that up. It's a true story. Anyways, back to the Quarry District. It has an impressive history and I'm sure you'll enjoy Quarry Park Adventures even more knowing the rich history on which it's built. History buffs! Start Your Engines! Back in the 1850s, there was a ton of interest (but not a ton of gold) in the Secret Ravine area as a possible gold mine! Well, that didn't quite pan out (yes, it's another of those awful puns I can't resist) so the mining went from gold to granite. The earliest recorded use of the rock (called salt and pepper granite) from this area was for Fort Mason in 1855 (in San Francisco). Get this, at one time there were 22 rock quarries operating in Rocklin! If you drive around the Quarry District now, you can still see evidence of how that gorgeous granite was used in some of the historical buildings. But to get a for a close look at ground zero for where that granite came from, just visit Quarry Park Adventures! It'll take your breath away for lots of reasons! Thrills that keep on giving! Fitness, family and fun when happening together is a great investment in the future! I think there isn't one generation that hasn't realized the value of being "that family with the backyard pool for kids and friends" or having a family tradition that is extra special because it's always "at that place where everything from family reunions to impromptu picnics happen over the years". Somehow the fabric of what we want for our family memories gets woven with where we celebrate and gather together. That's what Quarry Park Adventures can become for those of us who visit there. Read on to learn why. I bet you'll agree with me. From Up in the Air to the Comforts of Ground Level, There's Something for Everyone! As I've shared before, I’m a person that's first out the gate when offered something new to try (within limits, of course). Even though I couldn't experience everything on a day that I first visited it, (Quarry Park Adventures was closed for the winter season), I saw enough to wet my appetite; I'll be back as soon as I get word it's opened! After seeing this place in person (I highly recommend doing this even if it isn't open) I came right home and researched everything I saw! 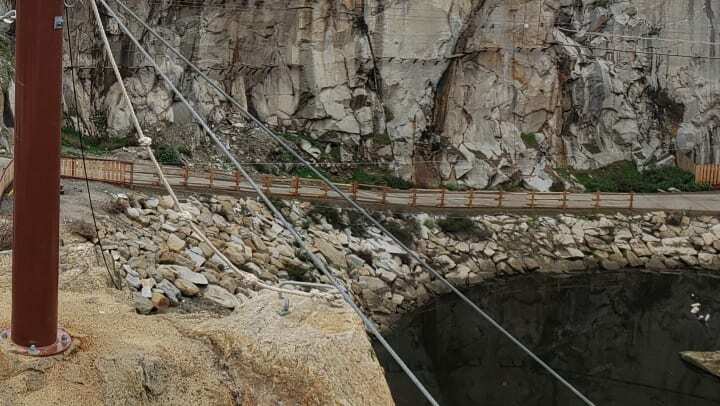 The sheer enormity of the quarry is incredible and lends itself to several levels of thrill-seeking! First, there's a zip line on something called "The Cliffhanger". Mind you, this includes what they call "Zip the Pit" above Big Gun Quarry (at least 1,200 feet above it) down 60 feet above the canyon floor. Ummmm? That's sounds amazing, doesn't it? Now throw in doing this with family and friends and you've got a real fun situation! Nothing screams fun like competing to fly through a quarry faster than anyone else around you, right? Then there are other zip lines that are not as extreme in height. 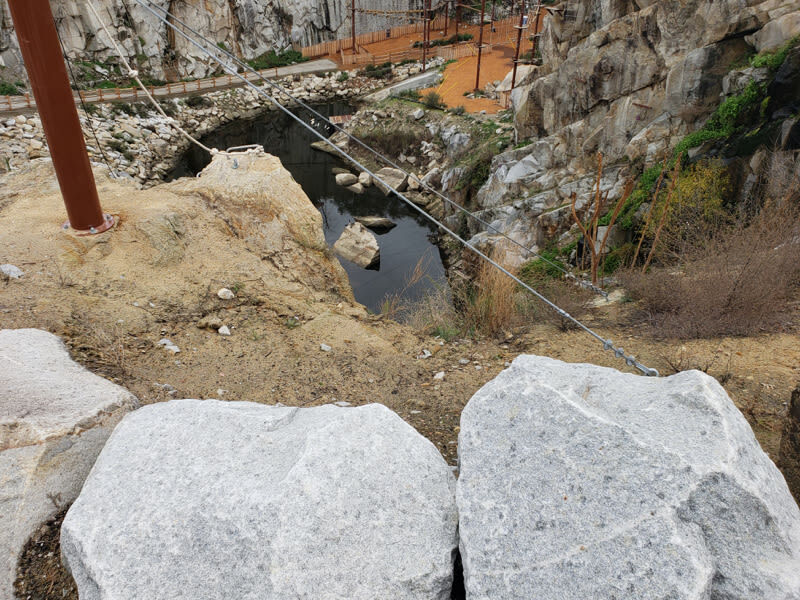 But if you're too young for this kind of fun, Quarry Kids Kove is an area where young kids can enjoy things like small version zip lines, balance beams, boulder climbs and climbing nets. There are over 30 challenge elements where little ones can play in a fully enclosed area of the park with relaxed seating available for parents watching their kids (although parents are invited to accompany their children, if they prefer). If in the air and on the ground isn't your thing, go climb a wall. If you'd rather climb walls and see things from a different perspective, that is available too at Quarry Park Adventures! 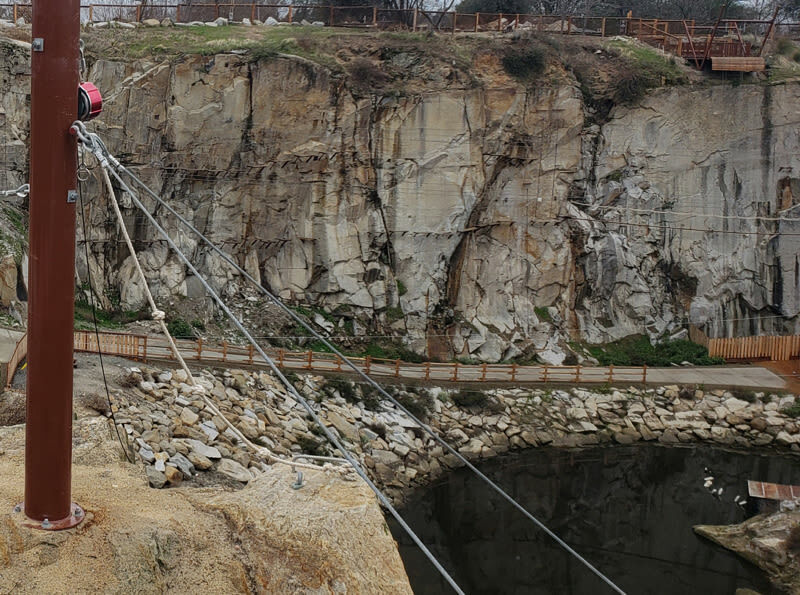 About 40 feet above the quarry is something called The Prospector (a.k.a. high level) and a bit lower is The Boom Pointer (a.k.a. not so high). The whole idea is to climb around the inside of the quarry as you climb higher and higher and then exit by a waterfall. Speaking of water, there’s more! 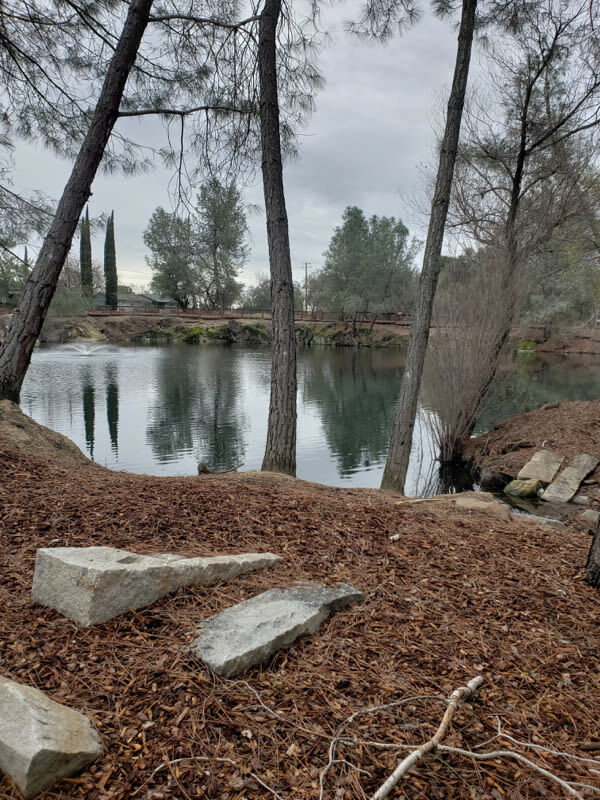 The history of the quarry's operations includes being one of Rocklin's favorite swimming locations (or holes, as they were usually called then) for locals. Well, you can feel this lake's deep history (wait, was that another pun?) when you float on Quinn Quarry Lake. It's a great addition (or option instead of) zipping and climbing. You can take a row or paddle boat around this beautiful lake while appreciating the sounds of splashing created by a large water fountain. From what I hear, it's one of the very popular things visitors do during the warm weather months and I can see why. It's just gorgeous out here and includes landscaping with vintage artifacts. Well, I've shared quite a bit and there's still so much more to say. Remember that Quarry Park Adventures is just one part of Quarry District in Rocklin. In addition to this unique adventure park, there's also an amphitheater with a summer concert series, walking trails, open space with opportunities to spot wildlife, a children's playground and even a wooden train play structure. Now while you're in the area, don't forget to soak in some other historical sites like Fire Station No. 23, Finnish Temperance Hall, Rocklin History Museum and much more! Quarry Park Adventures awaits you and your fun-seeking squad! It's the perfect place for family bonding time, team building, reunions, solo-ventures and what about this idea? After the last of your moving tasks are over and you've left your treasures at Stanford Ranch Self Storage, treat yourself and your moving crew to everything from zipping to floating at Quarry Park Adventures! It's the treat you all deserve! P. S. Never Miss a Beat! Join the Quarry Club Today! https://quarrypark.com/quarry-club/ to stay up to date on all the fun happenings.